TASK FORCE 52 (Amphibious Support Force), commanded by Rear Admiral William H.P. Blandy, included an Air Support Control Unit, support Carrier group, Mine Group, Underwater Demolitions Group, Gunboat Support Group, Mortar Support Group, and a Rocket Support Group. The mission of this force was to furnish preliminary (pre-D-day) gunfire and air support including preparation fires, mine sweeping, net laying, beach reconnaissance, and underwater demolition. At 0600 D-Day, TF 52 passed to the direct command of Vice Admiral Turner. Rear Admiral Blandy then assumed command of TG 51.19 (Night Retirement Groups). TASK FORCE 53 (Attack Force), commanded by Rear Admiral Harry W. Hill. This force was comprised of an air support control unit, embarked assault troops, two transport squadrons, tractor groups, LSM groups, control group, beach party group, and a pontoon barge, causeway, and LCT group. Its mission was to transport and land the Expeditionary Troops. TASK FORCE 54 (Gunfire and Covering Force), commanded by rear Admiral Bertram J. Rodgers. This force was composed of three battleship divisions, one cruiser division, three destroyer divisions, and was reinforced on D-Day by an additional two destroyer divisions from Task Force 58. On D-plus-1 two cruiser divisions and two more destroyer divisions from TF 58 joined the Gunfire and Covering Force of Iwo Jima. The potent aggregation thus assembled combined their power to furnish shore bombardment and protect the vulnerable invasion shipping from enemy surface attack. TASK GROUP 56.1 (Landing Force), commanded by Major General Harry Schmidt. General Schmidt's Landing Force Headquarters provided over-all command and coordination of all troops ashore, including shore-based air units, during the attack. 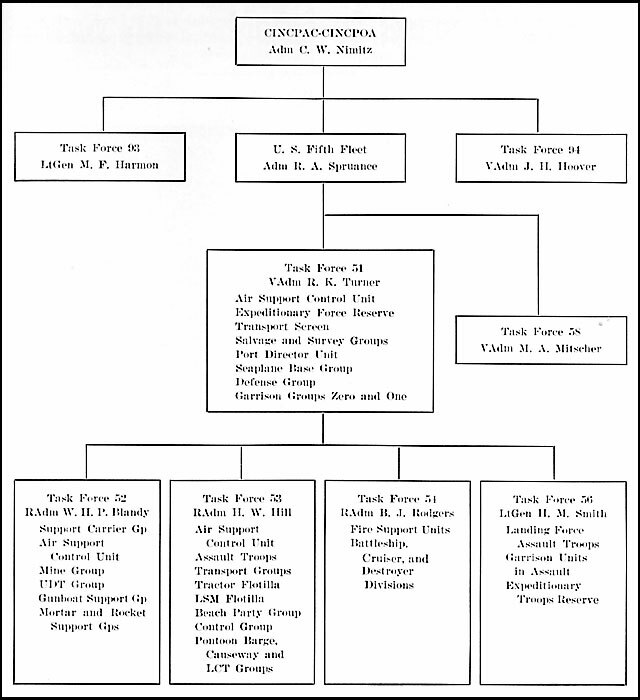 TASK GROUP 56.2 (Assault Troops), 4th and 5th Marine Divisions commanded by Major Generals Clifton B. Cates and Keller E. Rockey, respectively, plus Corps Troops. 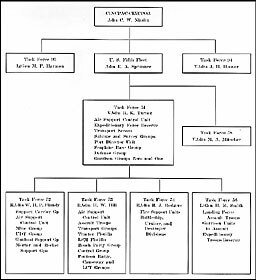 TASK GROUP 10.16 (Army Garrison Force), commanded by Major General James E. Chaney, USA. TASK GROUP 56.3 (Expeditionary Troops Reserve), the 3d Marine Division (Reinforced) commanded by Major General Graves B. Erskine. TASK FORCE 58 (Fast Carrier Force of Admiral Spruance's Fifth Fleet), commanded by Vice Admiral Marc A. Mitscher. Carrier aircraft of TF 58 supported the Iwo operation through diversionary strikes on the enemy homeland and supplied close air support at the objective. Fire support vessels of TF 58 also provided valuable firepower at Iwo for several days commencing on D-Day. TASK FORCE 93 (Strategic Air Force, Pacific Ocean Areas), composed primarily of land-based heavy bombers flying from airfields in the Marianas. These planes, predominantly B-24's of the Seventh USAAF, helped soften the target for assault and, beginning on D-Day, delivered several deep support air strikes on the objective and night harassing and destructive air strikes on the Bonin Islands. TASK FORCE 94 (Forward Area, Central Pacific), under Vice Admiral John H. Hoover, provided assault forces with base facilities, logistical support and various rear echelon services.